Ordinary Goodness: Starting the conversation: a day with Rachel Held Evans. Starting the conversation: a day with Rachel Held Evans. Since I became one of Rachel's readers in print* and online, I've enjoyed her wonderful writing, wit, and openness. I've appreciated her willingness to ask hard questions, her ability to call others into conversation, and her honesty about her own life and faith. Witnessing her vulnerability in the crazy Internet world (perhaps especially the Christian Internet world) gives me hope and courage. I write because I like to think that sharing a little bit of my own journey might impact others for good. Rachel does that, and she inspires me to keep at it. As my great-uncle would put it, she tells it like it is. What she does in writing translates beautifully to real life. 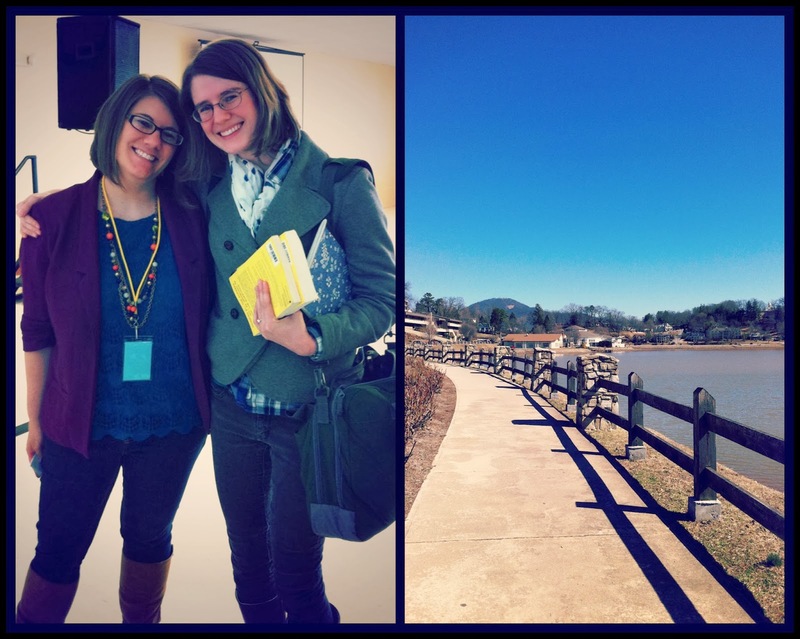 I jumped at the chance to attend a day-long event with Rachel this past weekend at Lake Junaluska, the hub of the UMC's Western North Carolina Conference (and where my family met for reunions for many years). There were about 40 folks there, men and women of all ages, ready to listen and speak about the Bible as a conversation-starter instead of a conversation-ender, especially when it comes to controversial topics like women in the church. Rachel is polished but off-the-cuff, smart and funny, heartfelt and purposeful, and her faith shines through every bit. Listening to her story, thoughts and research in person made me grateful once again that there is someone like her in the world. She invited us into the conversation, to offer our thoughts, opinions and stories, and she listened to every one. Before lunch, she and I had a lovely little conversation about Methodism, my MFA, blogging, and scarves. She took her time, and didn't rush me in the midst of many other fans hoping to speak with her. I felt that she genuinely valued my unique presence there. So thank you, Rachel. It was a great day! Below are the scribbled notes I took as Rachel shared her ideas about the Bible as a conversation-starter - not nearly everything that was discussed, but things that stood out to me. - People are looking to the Bible as a blueprint - but Biblical women do not fit a blueprint or a mold. - God uses stories to communicate with us. And stories don't fit a blueprint. - The Bible should be a conversation starter, not a conversation ender. It is a dynamic vessel. - Struggling with the Bible brings us into community. - There are principles of interpretation when reading the Bible: Genre, context, audience, language. - "I want to follow Jesus with my head and my heart intact." - The church should be a refuge where women can be themselves. - Ideas like creationism give the misconstrued idea that the only things worth believing must be "literal" or "true." - Approach the Bible from a position of humility. - God chooses dialogue over monologue. - "Ultimately, Christianity is not about a book. It's about a person."